A few photos taken at the Biennial. More cartoon in Chubasco's blog. 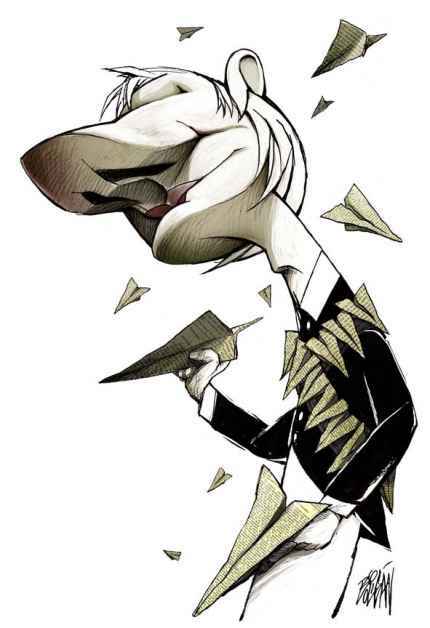 ...this likeness of Julian Assange. 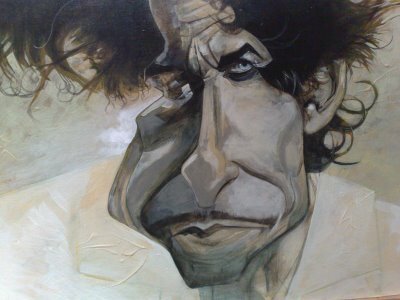 It won Boligan the Second Prize in the "caricature" category at the World Press Cartoon 2011 contest in Sintra, Portugal. 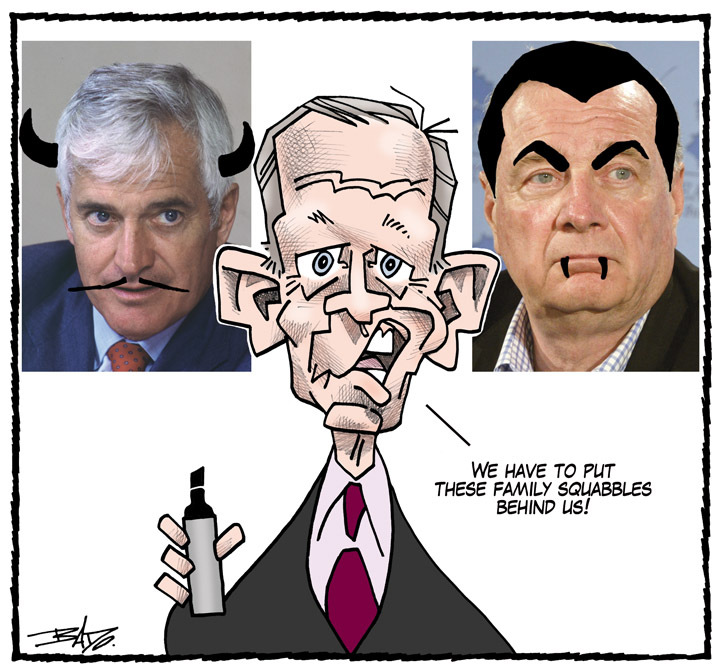 Former Liberal Party of Canada leader and Prime Minister of Canada Jean Chrétien defaces the portrait of predecessor John Turner and successor Paul Martin. 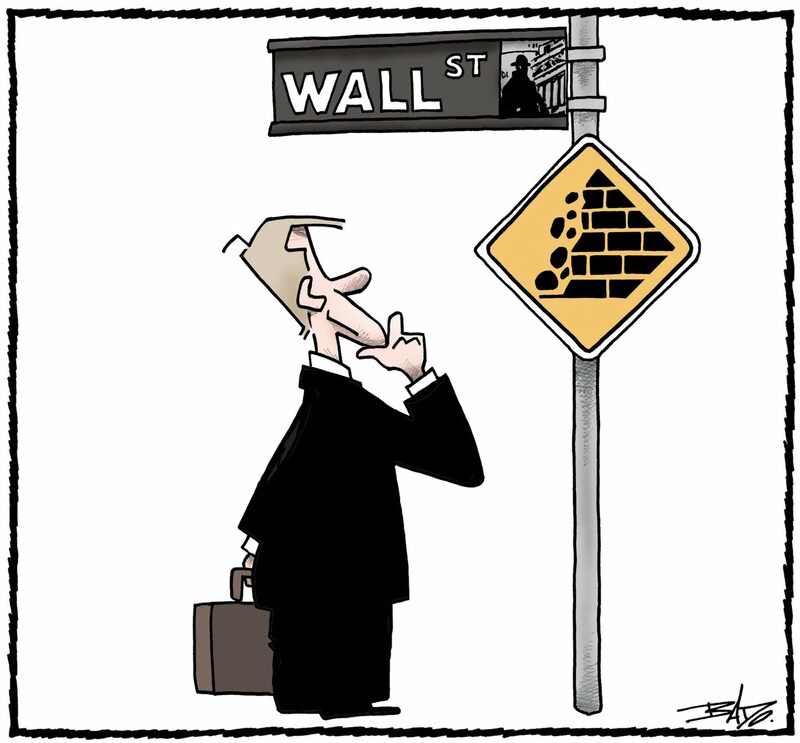 Thirty years ago today, Le Droit published my first cartoon on its' editorial page. Marlene Pohle and Zoran Petrovic of FECO (Federation of Cartoonists Organisations) and Meisi Grill of the Förderverein Komische Pinakothek will be holding a sale of cartoons for the benefit of the victims of the latest tsunami in Japan. 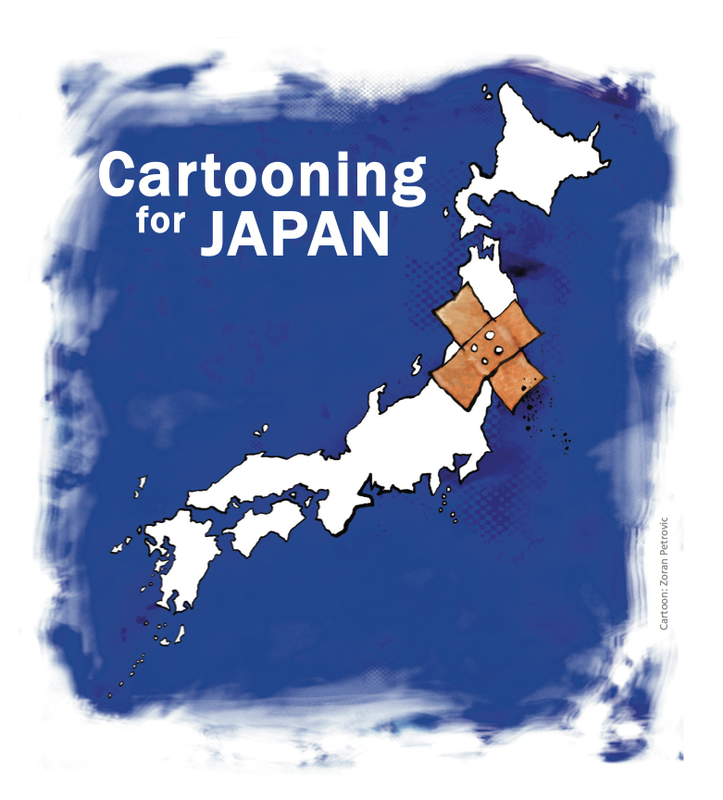 In the beautiful rooms of the Förderverein Komische Pinakothek, Herzog-Rudolf-Straße 9, Munich, they will, on May 26 / 27, offer for sale originals and signed prints of renowned cartoonists and entrust the receipts to the Japanese consul and the president of FECO Japan. 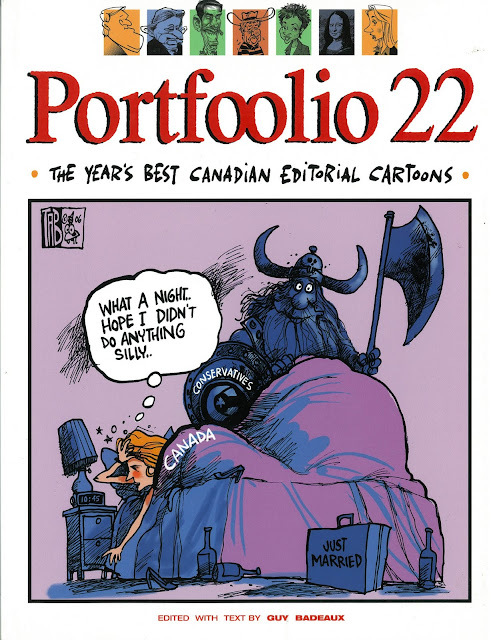 Last night in Ottawa, Brian Gable of The Globe & Mail took home his sixth NNA for drawings on subjects as diverse as American politics and the rise of a tech-savvy generation with little knowledge of books. 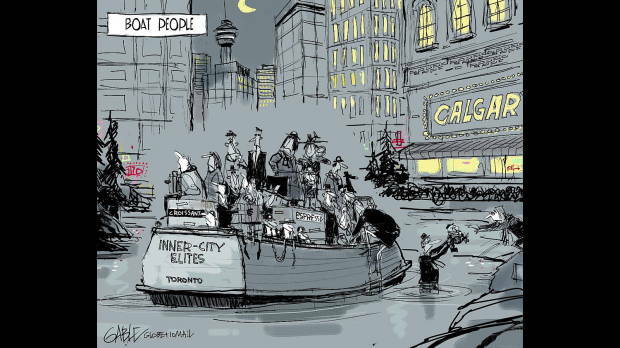 In one memorable take on the role-reversal of Toronto and Calgary’s mayoral races, he depicted a boat-load of elite Easterners fleeing Rob Ford country for the sanctuary of the Naheed Nenshi-run Alberta city. 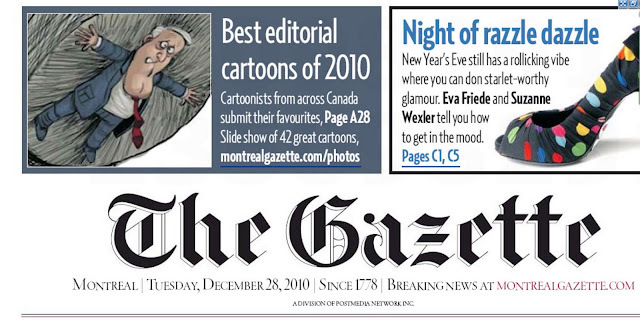 The finalists were Montrealers Terry Mosher (Aislin) of The Gazette and Serge Chapleau of La Presse. 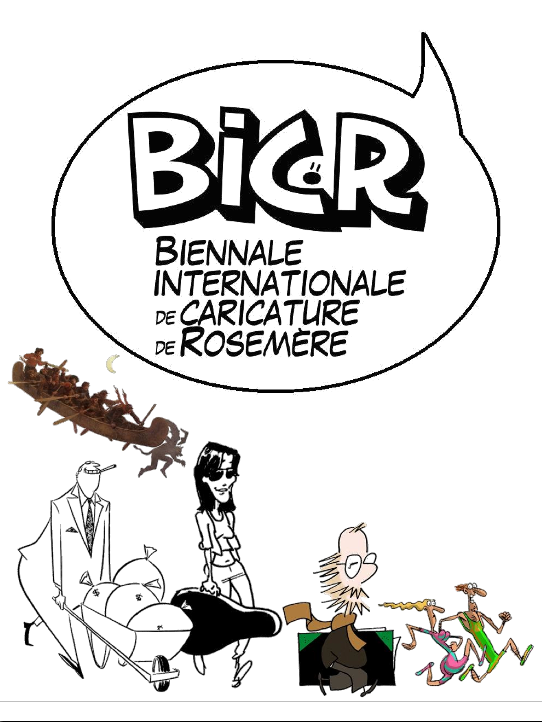 The City of Rosemère, north of Montreal, will be holding, on the weekend of May 27-29 2011, the first edition of it’s Biennale of Caricature. 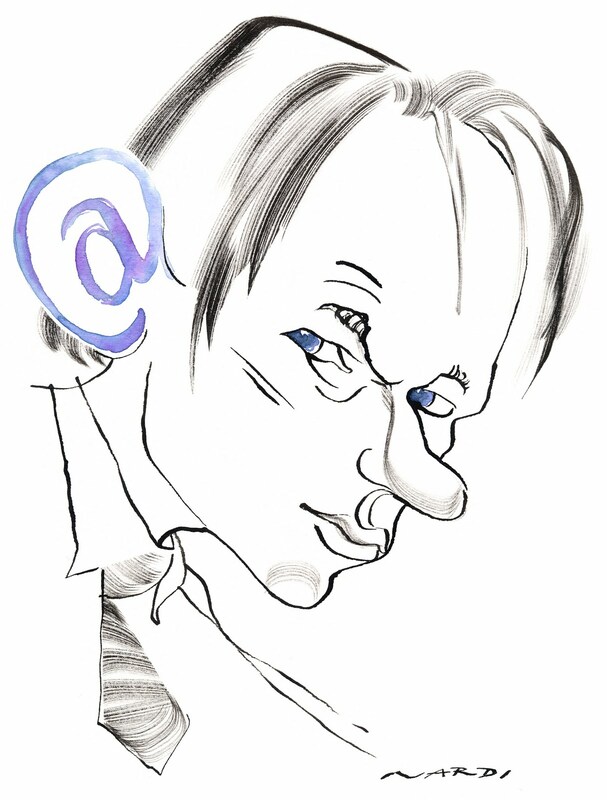 -Le Droit editorial cartoonist Bado, who will also serve as honorary president of the event. There will also be presentations by cartoon historian Mira Falardeau as well as cartoonists Yves Demers, Ferg Gadzala and Robert Lafontaine. 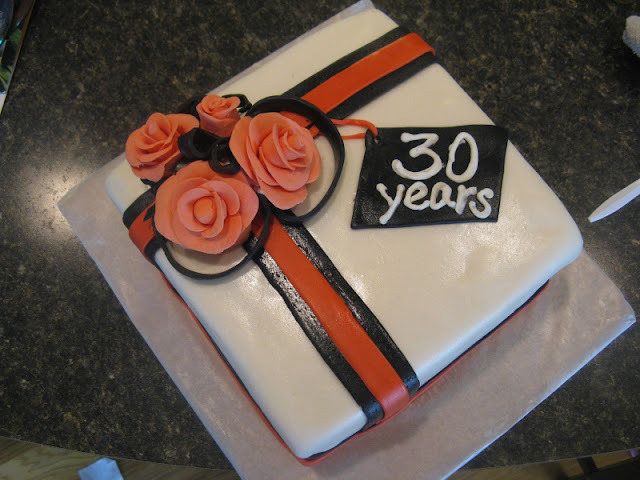 May 3rd. 2011 saw the opening of the exhibition "Freedom of Expression in Broad Strokes" at the Panorama Room of the National Arts Centre in Ottawa. 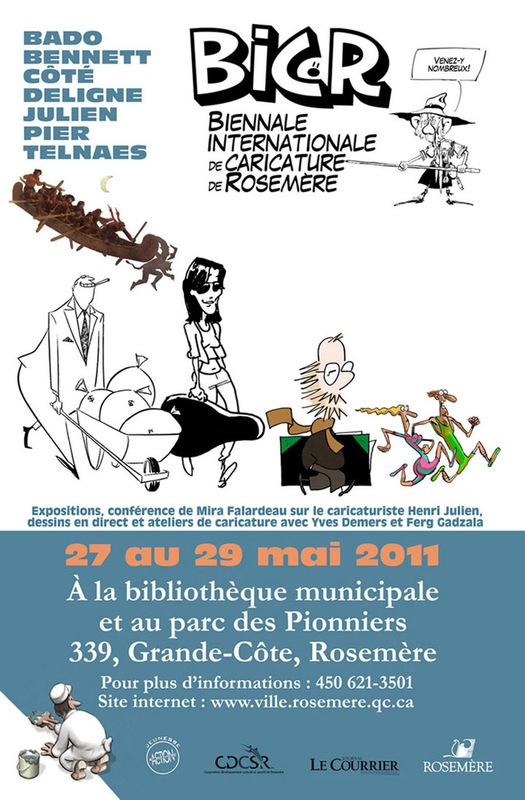 The traveling exhibition, sponsored by the Canadian Committee for World Press Freedom and the Canadian Commission for UNESCO and produced by "Bleu, blanc rouge / Kolegram" celebrates the first ten years of the CCWPF editorial cartoon contest and displays, on 12 giant panels, a selection of the winning entries. 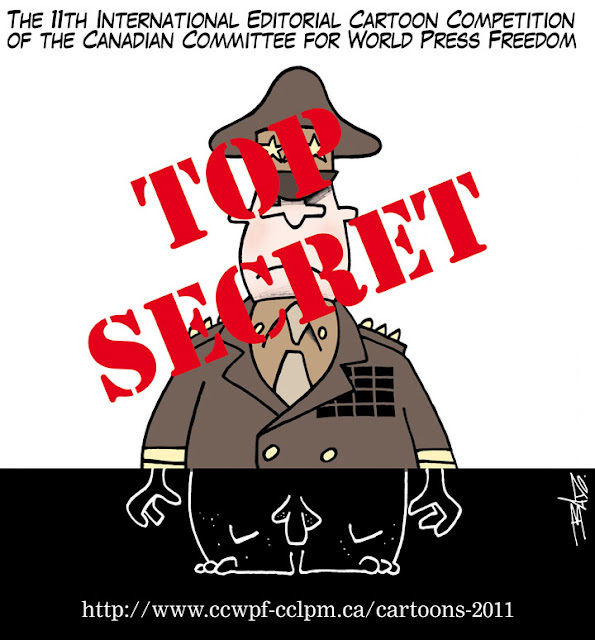 Although somewhat overshadowed by the federal election, the 13th annual World Press Freedom Awards luncheon in Ottawa on May 3 was a great success, with almost 200 participants to hear Tony Burman, formerly director of Al Jazeera English and now based in Washington. He analyzed the challenges to the media in covering the Arab Spring, and the impact of new media in that turmoil. 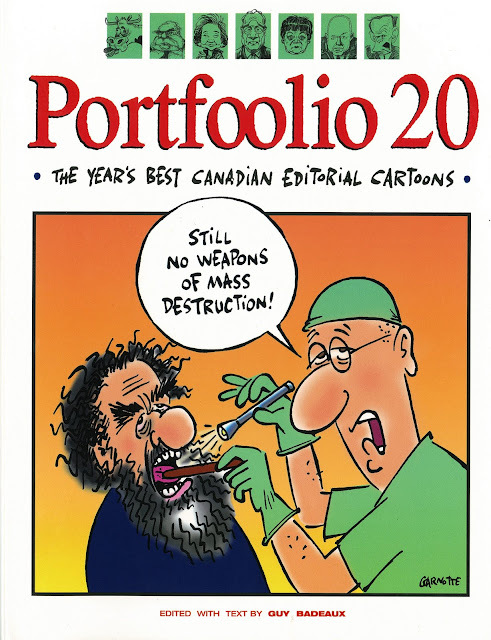 The jury of the 11th World Press Freedom International Editorial Cartoon Competition, composed of Pauline Dugré and Alysouk Lynhiavu of the Canadian Commission for UNESCO, as well as myself, met last April 11 to choose the winners. 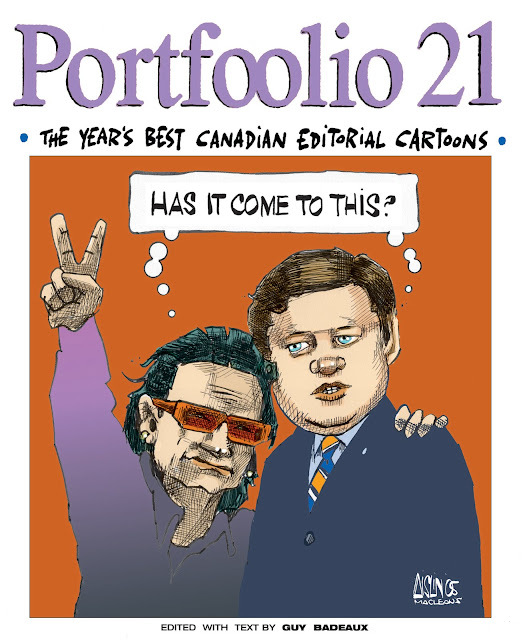 They were announced at the World press Freedom Day Luncheon held at the National Arts Centre in Ottawa on Tuesday, May 3rd. 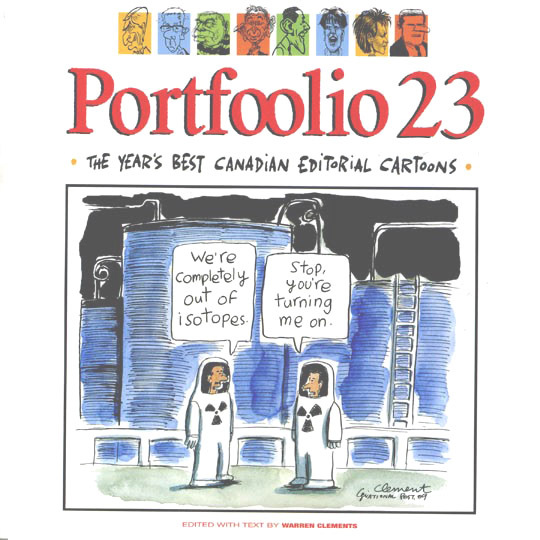 Last December, 42 members of the Association of Canadian Editorial Cartoonists were asked to send their favourite cartoons of 2010 to president of the ACEC Terry Mosher (Aislin). The Gazette published 8 of their submissions on their editorial page on December 28, 2010 and The Province, in Vancouver, published 6 of them the previous day. The annual collection highlights the past year's editorial cartoons with a wry, breezy accompanying text to remind readers which politicians shot themselves in the foot and which tycoons fell from grace. More than 250 cartoons by the best in the profession! 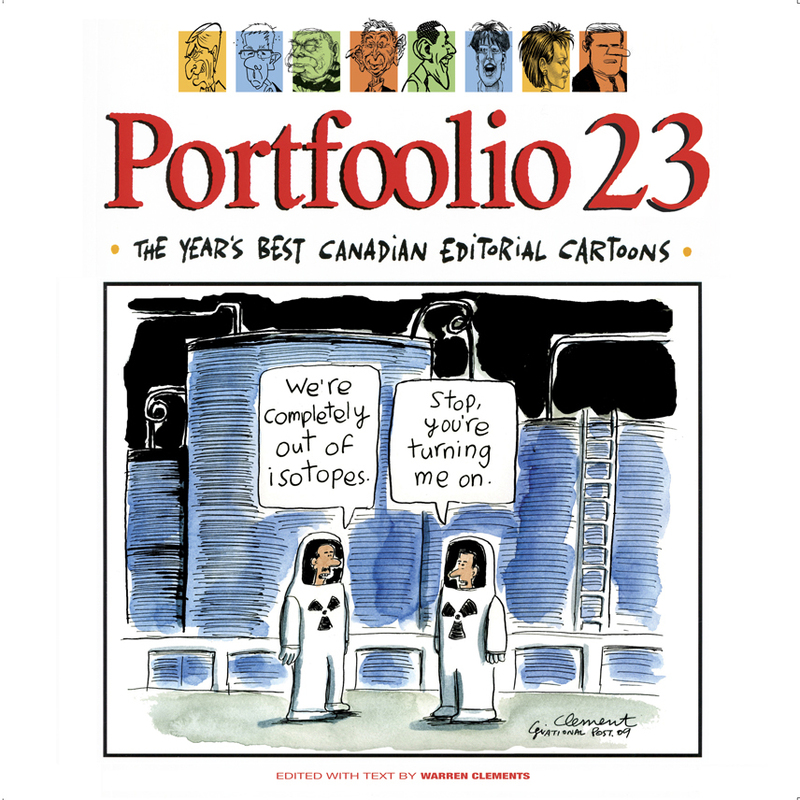 After an hiatus of two years, the annual collection, now edited by Warren Clements of The Globe & Mail, highlights the past year’s editorial cartoons with a wry, breezy accompanying text to remind readers which politicians shot themselves in the foot and which tycoons fell from grace. The following cartoons didn't make the cut in Portfoolio 23 but on the other hand, their original version were published in my latest book Sans dessins du Prophète. 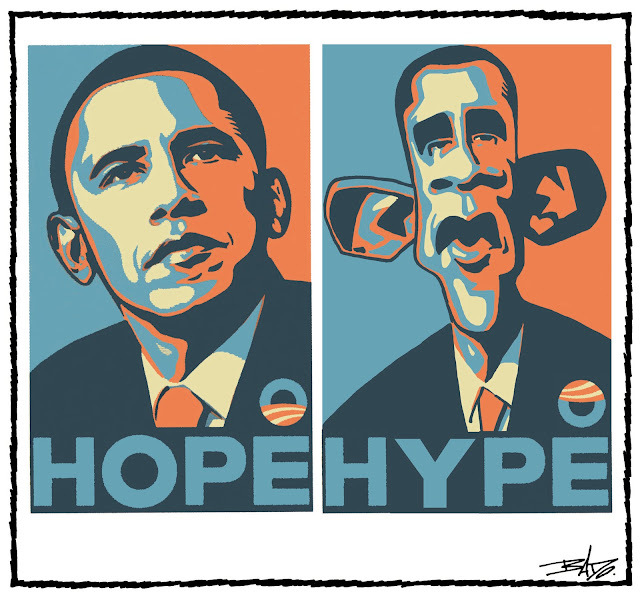 There was much grief and gnashing of teeth in certain quarters when Dubya sashayed out of the White House this year, and when Sarah Palin failed to make it in, with John McCain. 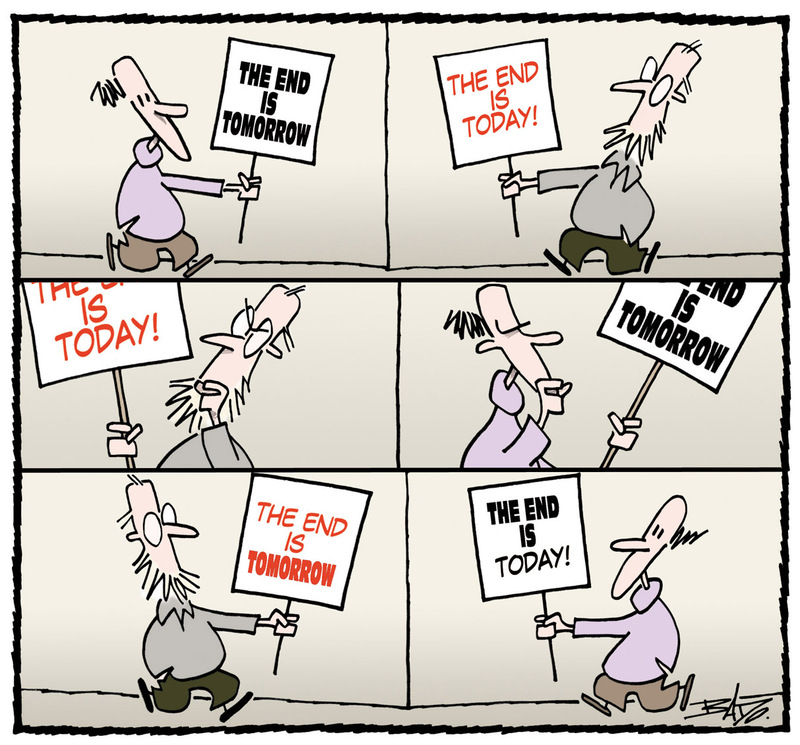 No, not only among the Republicans, silly. But also among editorial cartoonists. 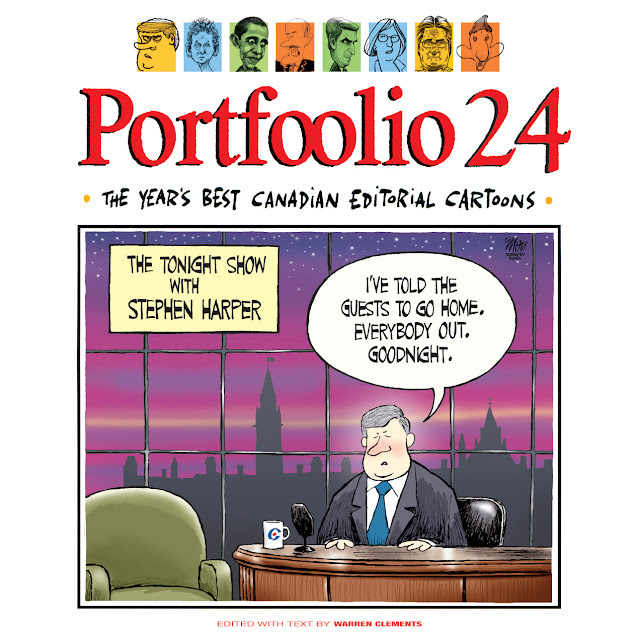 The year signaled the end of twelve years of Liberal rule and the arrival of a new Conservative government. Our vocabulary was enriched this year by expressions like “wardrobe malfunction” and “circumpolar tour” which, to our surprise, were not uttered by Conrad Black. 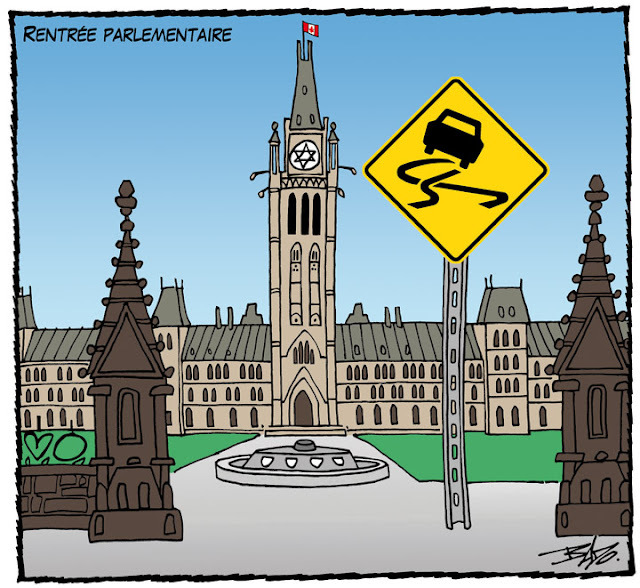 As you are reading this, Paul Martin could already be prime minister of Canada, Arnold Schwarzenegger could be governor of California and Saddam Hussein either dead or captured by the Americans. 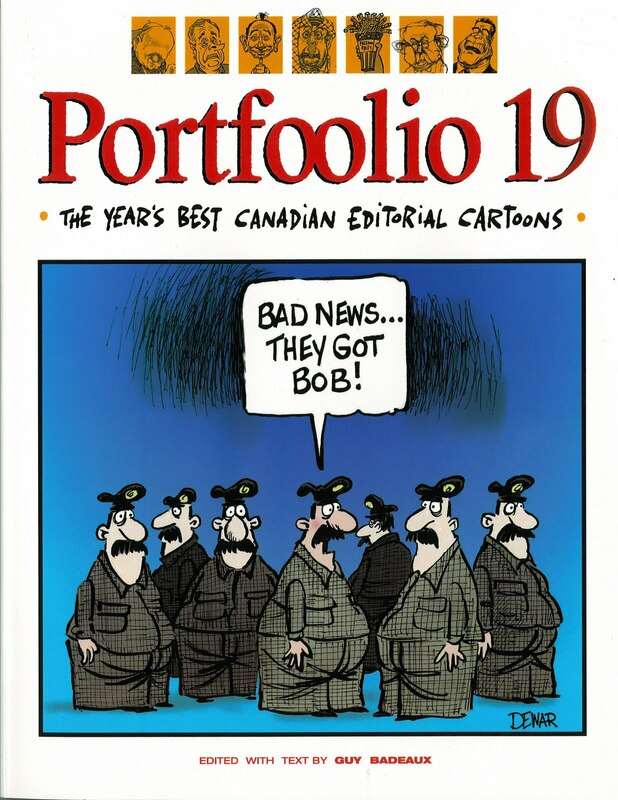 Portfoolio was born in the summer of 1985 when McClelland & Stewart, which had published two previous collections of Canadian editorial cartoons in 1983 and 1984, decided not to renew the experience. 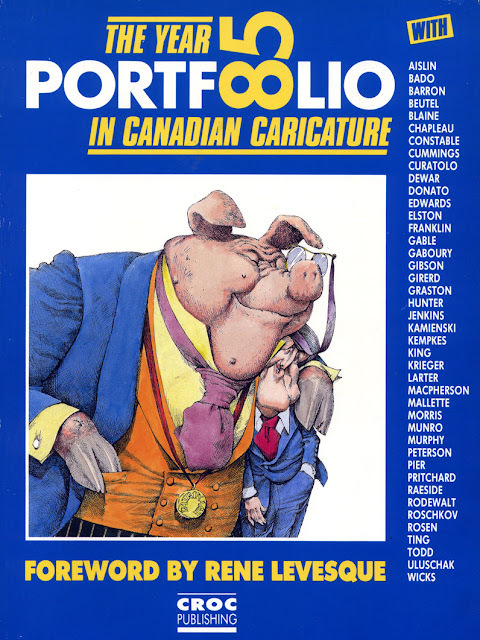 A publisher was found in Montreal (Croc Publishing) and Portfoolio 85: The Year in Canadian Caricature saw the light that fall.